"Crescendo" redirects here. For other uses, see Crescendo (disambiguation). "Fortissimo" redirects here. For other uses, see Fortissimo (disambiguation). Some pieces contain dynamic designations with more than three f's or p's. In Holst's The Planets, ffff occurs twice in Mars and once in Uranus often punctuated by organ and fff occurs several times throughout the work. It also appears in Heitor Villa-Lobos' Bachianas Brasileiras No. 4 (Prelude), and in Liszt's Fantasy and Fugue on the chorale "Ad nos, ad salutarem undam". The Norman Dello Joio Suite for Piano ends with a crescendo to a ffff, and Tchaikovsky indicated a bassoon solo pppppp (6 p's) in his Pathétique Symphony and ffff in passages of his 1812 Overture and the 2nd movement of his Fifth Symphony. Igor Stravinsky used ffff at the end of the finale of the Firebird Suite. ffff is also found in a prelude by Rachmaninoff, op.3-2. Shostakovich even went as loud as fffff (5 f's) in his fourth symphony. Gustav Mahler, in the third movement of his Seventh Symphony, gives the celli and basses a marking of fffff (5 f's), along with a footnote directing 'pluck so hard that the strings hit the wood.' On another extreme, Carl Nielsen, in the second movement of his Symphony No. 5, marked a passage for woodwinds a diminuendo to ppppp (5 p's). Another more extreme dynamic is in György Ligeti's Études No. 13 (Devil's Staircase), which has at one point a ffffff (6 f's) and progresses to a ffffffff (8 f's). In Ligeti's Études No. 9, he uses pppppppp (8 p's). In the baritone passage Era la notte from his opera Otello, Verdi uses pppp. 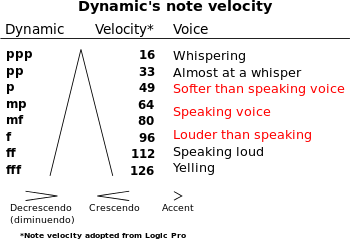 Steane (1971) and others suggest that such markings are in reality a strong reminder to less than subtle singers to at least sing softly rather than an instruction to the singer actually to attempt a pppp. Dynamic indications of this kind are relative, not absolute. mp does not indicate an exact level of volume, it merely indicates that music in a passage so marked should be a little louder than p and a little quieter than mf. Interpretations of dynamic levels are left mostly to the performer; in the Barber Piano Nocturne, a phrase beginning pp is followed by a diminuendo leading to a mp marking. Another instance of performer's discretion in this piece occurs when the left hand is shown to crescendo to a f, and then immediately after marked p while the right hand plays the melody f. It has been speculated that this is used simply to remind the performer to keep the melody louder than the harmonic line in the left hand. In some music notation programs, there are default MIDI key velocity values associated with these indications, but more sophisticated programs allow users to change these as needed. Apple's Logic Pro 9 uses the following values: ppp (16), pp (32), p (48), mp (64), mf (80), f (96), ff (112), fff (127). Sudden changes in dynamics may be notated by adding the word subito (Italian for suddenly) as a prefix or suffix to the new dynamic notation. Accented notes (notes to emphasize or play louder compared to surrounding notes) can be notated sforzando, sforzato, forzando or forzato (abbreviated sfz, sf, or fz) ("forcing" or "forced"). Accents can also be notated using the sign >, placed above or below the head of the note. The > sign indicates an accent only, and is neither related to nor derived from the sign for diminuendo, even though the signs are of a roughly similar shape. Sforzando (or sforzato or forzando or forzato), indicates a forceful accent and is abbreviated as sf, sfz or fz. There is often confusion surrounding these markings and whether or not there is any difference in the degree of accent. However all of these indicate the same expression, depending on the dynamic level, and the extent of the Sforzando is determined purely by the performer. The fortepiano notation fp indicates a forte followed immediately by piano. Sforzando piano (sfzp or sfp) indicates a sforzando followed immediately by piano; in general, any two dynamic markings may be treated similarly. Rinforzando, rfz or rf (literally "reinforcing") indicates that several notes, or a short phrase, are to be emphasized. Hairpins are usually written below the staff, but are sometimes found above, especially in music for singers or in music with multiple melody lines being played by a single performer. They tend to be used for dynamic changes over a relatively short space of time (at most a few bars), while cresc., decresc. and dim. are generally used for changes over a longer period. Word directions can be extended with dashes to indicate over what time the event should occur, which may be as long as multiple pages. For greater changes in dynamics, cresc. molto and dim. molto are often used, where the molto means much. Similarly, for slow changes poco cresc. and poco dim. are used, where poco translates as a little. A good example of a piece that uses both gradual changes and quick changes in dynamics is Pyotr Ilyich Tchaikovsky's fantasy overture, Romeo and Juliet. "Diminuendo" redirects here. For the album by Lowlife, see Diminuendo (album). For the thoroughbred racehorse, see Diminuendo (horse). The Renaissance composer Giovanni Gabrieli was one of the first to indicate dynamics in music notation, but dynamics were used sparingly by composers until the late 18th century. Bach used some dynamic terms, including forte, piano, più piano, and pianissimo (although written out as full words), and in some cases it may be that ppp was considered to mean pianissimo in this period. The fact that the harpsichord could play only "terraced" dynamics (either loud or soft, but not in between), and the fact that composers of the period did not mark gradations of dynamics in their scores, has led to the "somewhat misleading suggestion that baroque dynamics are 'terraced dynamics'," writes Robert Donington. In fact, baroque musicians constantly varied dynamics. "Light and shade must be constantly introduced... by the incessant interchange of loud and soft," wrote Johann Joachim Quantz in 1752. In addition to this, the harpsichord in fact becomes louder or softer depending on the thickness of the musical texture (four notes are louder than two). This allowed composers such as Bach to build dynamics directly into their compositions, without the need for notation. In the Romantic period, composers greatly expanded the vocabulary for describing dynamic changes in their scores. Where Haydn and Mozart specified six levels (pp to ff), Beethoven used also ppp and fff (the latter less frequently), and Brahms used a range of terms to describe the dynamics he wanted. In the slow movement of the trio for violin, horn and piano (Opus 40), he uses the expressions ppp, molto piano, and quasi niente to express different qualities of quiet. 1 2 Randel, Don Michael (2003). The Harvard Dictionary of Music (4th ed.). Cambridge, MA, US: Harvard University Press Reference Library. ↑ "Piano". Virginia Tech Multimedia Music Dictionary. Retrieved 2012-03-19. ↑ "Forte". Virginia Tech Multimedia Music Dictionary. Retrieved 2012-03-19. 1 2 "Dynamics". Virginia Tech Multimedia Music Dictionary. Retrieved 2012-03-19. ↑ "Apple Logic Pro 9 User Manual for MIDI Step Input Recording". Retrieved 2013-07-29. ↑ .Gerou, Tom and.Linda Lusk (1996). Essential Dictionary of Music Notation: The Most Practical and Concise Source for Music Notation. Van Nuys, CA: Alfred Music Publishing. pp. 37–38. ISBN 978-0882847306.